I was a recent guest on the TechnologyAdvice Expert Interview Series. The series, which is hosted by TechnologyAdvice’s Josh Bland, explores a variety of business and technology landscapes through conversations with industry leaders. In this episode Josh and I discuss everything from business process automation to workflow and forms, my SharePoint ideas, to the upcoming SPTechCon 2015 August 24-27 in Boston, MA. TechnologyAdvice: How are businesses starting to automate more and more of what they do everyday? Brad Orluk: When we talk about business process automation, virtually every type of business has a collection of various processes that make up what their business activities are. That may be production lines, assembly lines themselves, or research and development procurement. Virtually every type of horizontal on a business function can really benefit from automation. Think of HR and on-boarding offer letters, exchanging those back and forth, obtaining signatures, and dynamically generating an offer letter. Those different types of things can be completely automated with our tool set very, very easily. Obviously we don’t want to take the people out, because people have to approve these things. So approvals can be done with our product inside of their SharePoint infrastructure or it can be done even via mobile, because we have a discreet mobile app that tasks can be assigned to users while they’re on the go. So we’re really starting to bridge this space between virtually every environment. TA: Does that include workflows and forms – you mentioned those earlier – do you see those as being part of that ecosystem of automation? Orluk: Absolutely. Because at the end of the day, a solution — any kind of custom solution developed through Visual Studio as a standalone piece of software or something that lives inside of SharePoint — is but a collection of inputs and processing. So really what we’re doing is building tool sets that everyone inside your business’ constituency can really extract the maximum value out of — whether they are a power user or a developer, they can all use easy drag and drop tools to build out these types of solutions. TA: What are some challenges in this industry and how are you tackling them? Orluk: There are myriad challenges out there in this space. And it’s everything from headcount to paying employees to build custom solutions, to the cost associated with developing those solutions themselves. The expertise is a challenge because this is a place that’s really changing very rapidly, so skill sets become obsolete very quickly. And again, driving adoption of what we’ve already invested in. So making sure that customers who have bought things like SharePoint or SharePoint Online are maximizing the investment they have in that space. Our tools really allow you to maximize those investments because they help reduce the amount of effort that goes into building these types of solutions. So again, numerous challenges from the cost challenges to the time it takes, because everyone’s doing more with less. I think that we really enter in with a unique value proposition because we make it easy and quick, and again, appeal to a wide audience. TA: On mobile phones, how is the interaction of workflow automation going to move on devices more so than just a desktop? Orluk: At the end of the day our audiences are really very mobile, they all over the place, they’re connected to the Cloud, everyone’s computing in the palm of their hands with their smartphone. We’re trying to bring solutions that our users are building with our tools. We want to make sure that we have that in their hands; we have things like the ability to create custom mobile branded apps that will really integrate with solutions we built. At the end of the day, what we’re finding is the hybrid scenario is really the future. Everybody must maintain some kind of sovereignty of their data with their internal datacenters. We are finding that for extranets, other types of solutions, and integration with other platforms, they need to be in the cloud. So as time goes on, the lines between the on-prem and the cloud are going to become very, very blurred. We’re in a unique position because we offer solutions in both of those places that can leverage all of that functionality. So, I’m a big fan of working with metadata (SharePoint views FTW!) instead of logical hierarchies (folders = boo!) and, on several occasions, I have found myself needing to run an action (a review task or approval perhaps) against all of the documents inside of a SharePoint Document Set. But when I navigate to the Document Set I encounter a long and somewhat ugly URL for the set itself and begin the tedious work of recording the URL’s for each document. So how can I quickly retrieve all of the document URL’s? Enter Nintex Workflow, a few action configurations and voilà! 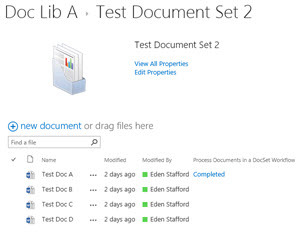 Our Document Library (Doc Lib A in this case), which has been configured with a Document Set content type, and our first Document Set (Test Document Set A). For realism, I’ve sprinkled it with a few Word documents, with fascinating names (such as the timeless, Test Doc 1-4!). For this exercise I will simply be recording each items URL in the workflow history. But, you could use your imagination here… Another scenario with the URL’s would be populating an email notification where users would need to review a document based on its metadata. Another could be that each document in the set would need to be copied to another location for a publishing or retention process, so we would need to collect its location for additional workflow actions. textDocSetRaw – A text variable to store each documents Context Item URL. textDocSetName – A text variable to store the isolated and cleaned up Document Set name. colDocument – A collection to store the list of all of the documents inside of the set. textDocumentUrl – A text variable to store each documents URL. We can now run this workflow against a specific Document Set and it will return the URL for each document inside. This is a handy tool for my SP bag. Maybe yours now?